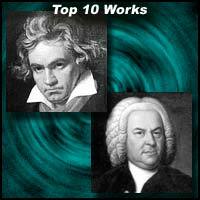 Criteria: Top 10 Works by Classical Composers are ranked for their innovation and influence, as well as their aesthetic importance, historical significance and lasting popularity. 1. Symphony No. 9 in D minor "Choral"
4. Symphony No. 3 in E flat major "Eroica"
5. Piano Sonata No. 23 in F minor "Appassionata"
6. Piano Concerto No. 5 in E flat major "Emperor"
8. Symphony No. 6 in F major "Pastoral"
2. Symphony No. 4 in E flat major "Romantic"
7. Symphony No. 3 in D minor "Wagner"
5. Polonaise #6 in A flat major, Op. 53 "Heroic"
1. Symphony No. 9 in E minor "New World"
3. String Quartet No. 12 in F major "American"
7. Piano Trio No. 4 in E minor "Dumky"
8. Organ Concerto No. 13 in F "Cuckoo"
2. String Quartet in C major, Op. 76 No. 3 "Emperor"
3. Symphony No. 101 in D major "The Clock"
4. Symphony No. 104 in D major "London"
5. String Quartet in B flat major, Op. 76 No. 4 "Sunrise"
6. Symphony No. 94 in G major "Surprise"
8. Mass No. 11 in D minor "Nelson"
9. Symphony No. 103 in E flat "Drum Roll"
10. String Quartets Op. 51 "The Seven Last Words of Christ"
2. Symphony No. 2 in C minor "Resurrection"
6. Symphony No. 1 in D major "Titan"
9. Symphony No. 6 in A minor "Tragic"
3. Symphony No. 4 in A major "Italian"
7. Symphony No. 3 in A minor "Scottish"
9. Symphony No. 5 in D major "Reformation"
3. Symphony No. 41 in C major "Jupiter"
1. Symphony No. 3 in C minor "Organ"
3. Symphony No. 9 in C major "Great"
5. Symphony No. 8 in B minor "Unfinished"
6. String Quartet No. 14 in D minor "Death & the Maiden"
7. Piano Quintet in A major "Trout"
4. Symphony No. 3 in E flat "Rhenish"
1. Symphony No. 6 in B minor "Pathetique"
2. Symphony No. 2 "London"
6. Symphony No. 3 "Pastoral"
10. Symphony No. 1 "Sea Symphony"